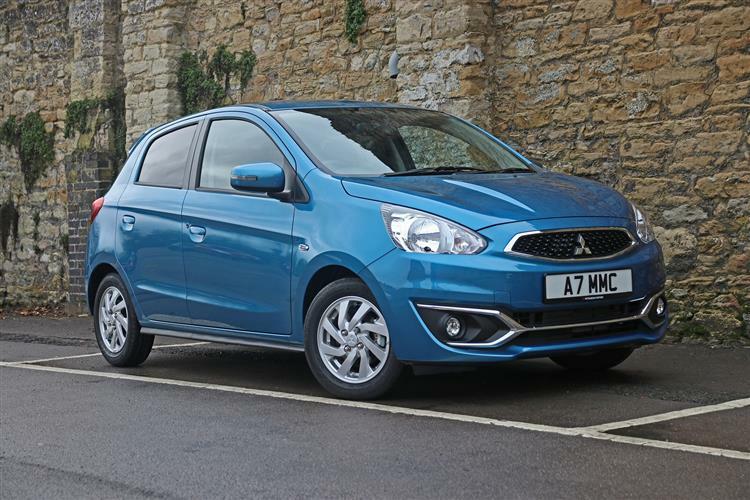 Mitsubishi's Mirage supermini bridges the gap between a little citycar and a slightly larger supermini. It remains affordable and extremely well equipped, but the design is hardly cutting edge. Still, if practicality and value matter above all else, it still has plenty to offer. Ensuring that this model remains an interesting option for the budget-minded driver. 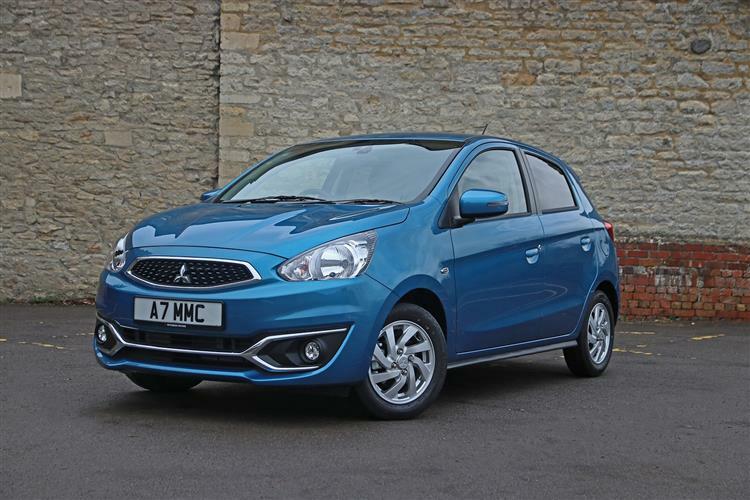 Mitsubishi tends to do small cars rather well. Not that you'd know, because they don't always get the marketing push they deserve in this country. In 2013, the brand introduced another one, the Mirage, an affordable, economic choice that really chimed with its time. Again though, it was somewhat overlooked by the market. Mitsubishi though, has a somewhat higher profile in the UK these days thanks to the success of its Outlander PHEV. 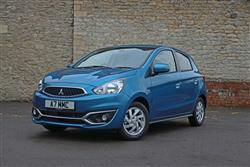 So it wants to give the Mirage another chance, relaunching it as the restyled, more efficient, classier 'Mirage Juro'. Will this supermini win budget-minded minds and hearts this time round? Time to find out..
You don't have to spend too long looking at the engineering of the Mirage to realise that it's been developed down to a price, with cost of running as a priority. Therefore it's not really fair to expect it to be a pin-sharp driver's car. For this revised version, Mitsubishi has focused on its 80PS 1.2-litre petrol powerplant, provided as before with either manual or CVT automatic transmission that takes the drag out of city driving. This engine is quite perky, in manual guise getting to 60mph in 11.7 seconds and running onto 112mph. The suspension has been tuned for ride comfort rather than handling precision, which is what most buyers need for urban use. The powerplant can be a little strained when you get it out of town and you will notice a fair amount of wind noise at speed, with the three-cylinder engine also adding a thrumming accompaniment. It's nothing you couldn't live with though. The steering is geared for ease of use at low speeds, which makes parking very easy at the detriment of high-speed precision. All round vision out of the car isn't at all bad, with just the thick rear three quarter pillars that affect most superminis earning a demerit. Even if you didn't know that the Mitsubishi design team had set out to style one of the most aerodynamic small cars you can buy, you might guess the fact from a look at this Mirage. Everything about the shape - the front grille with its minimal opening, the wind-cheating front bumper, the deeply sculpted sides - all of it's there to optimise a slippery airflow, and though the result certainly isn't the most distinctive look in the citycar sector, it's one that effectively achieves its objectives, with a 0.27Cd drag co-efficient that embarrasses some boxier rivals. The driving position's quite good, though the seats could be a little more supportive over longer distances and it's a pity that the steering column still doesn't adjust for reach as well as rake. What we do like though, is the way that the front-end design allows the driver to see right to the end of the bonnet, so making it easier to park. The low beltline improves sidewards vision too. Through the leather-trimmed multi-function steering wheel, a three-dial arrangement sees the main speedometer flanked by a rev counter to the left and a rather pointless 'ECO' meter to the right. Lower down in the speedo is an LCD trip computer that unfortunately you have to operate by using a plastic knob in the instrument binnacle rather than via the steering wheel. As before, this car is well packaged, with decent interior space front and rear. In fact, the amount of leg room provided is greater than that on offer from a number of bigger cars we could mention. There's a 235-litre boot. 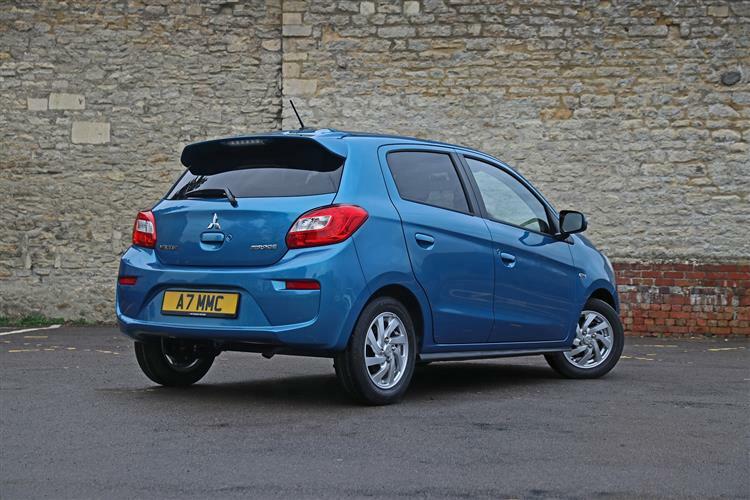 With prices starting from around £11,300, the Mirage competes mid-way between the citycar and supermini segments. That sum gets you the entry-level version '3'-spec version. There's also a plusher '4'-spec model, which is priced at just under £13,500 in manual form; an auto gearbox on this top variant will cost you another £665. Both variants are well specified. Even the '3'-spec model gives you 14-inch alloy wheels, LED rear lamps and a rear spoiler. The interior features air conditioning, leather steering wheel and Bluetooth with music streaming and a 4 speaker audio system. The Mirage 3 also features automatic rain sensors, a keyless entry operating system with push button start and an Auto Stop and Go (AS&G) system. Upgrade yourself to a Mirage 4 and you'll also get satellite navigation and a DAB audio, along with Apple CarPlay and Android Auto compatibility. Plus climate control, cruise control, heated front seats, Bi-Xenon front headlamps, rear parking sensors and 15-inch alloy wheels. Here's where the Mirage Juro really gets into its stride - day to day running costs. Yes, I'm aware that most superminis are pretty good in this regard, but it's often been the case that the less you spend on your supermini, the older and less efficient the engine is. It can indeed be a false economy to buy the cheapest car only to be saddled with mediocre fuel economy, poor emissions and a next to useless warranty. The Mirage counters with low emissions that sees the '3'-spec model scoring 107g/km of CO2 on the NEDC Corrolated cycle. Thanks to features like 'auto stop and go' that cuts the engine when you don't need it, regenerative braking, low friction tyres, a high efficiency alternator and a sleek 0.27Cd drag factor, the manual 1.2-litre '3' manual model manages to extract 55.4 miles from one gallon of unleaded on the combined WLTP cycle. For the auto '4'-spec version, it's 49.7mpg. Service intervals for the Mirage are every 12,500 miles or every twelve months. And your first year VED payment on this car will vary between £145 and £165, depending on the variant you choose. There are Citycar segment models that are very cheap to run. Others that can take a reasonable amount of luggage. And some that claim to be able to seat five people. But finding one contender in this class that can do all of these things pitched in at a reasonable price is a lot harder than you might think. But if these are your priorities, then this Mitsubishi will meet them. Let's be clear. It won't be your first choice if driving dynamics or cutting edge interior design are of highest importance, but that won't matter to the majority of buyers in this segment. 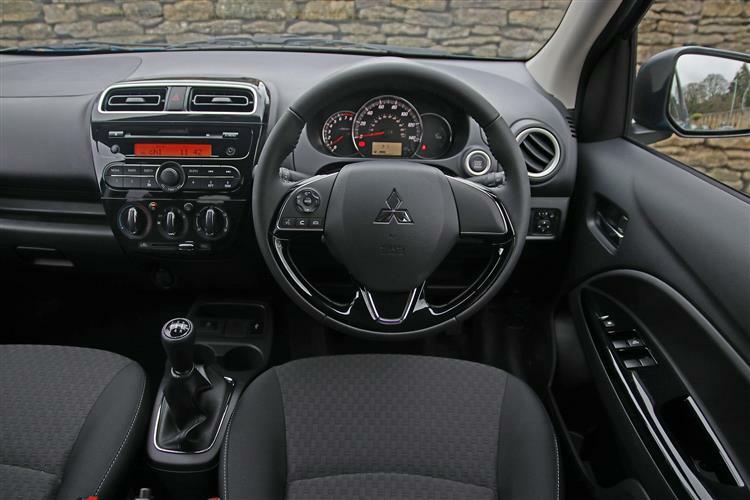 They might care a little more about the fact that there are a number of slightly cheaper rivals on offer, but with Mitsubishi offers, you'll find that the price differences aren't great and in any case, might rapidly be covered by the impressively efficient running costs on offer here. Ultimately, for me, it's a car that makes a lot of sense.